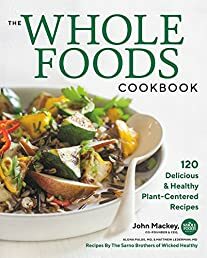 The Whole Foods Cookbook philosophy starts with the basic tenet that the most important dietary change you can make is to eat more fruits and vegetables. To help you navigate the nebulous world of healthy eating, the authors have written a clear and friendly introductory summary of the Whole Foods Diet's principles, the essential 8 foods to eat, tips on setting up a stress-free kitchen, and more. You'll also find specific guides on cooking beans and grains, building flavors, and impressive techniques like sautéing without oil and roasting to add layers of flavor. But most tantalizing are their 120 recipes covering breakfast, smoothies, entrees, pastas, pizzas, healthy desserts, and more. The ultimate goal of THE WHOLE FOODS COOKBOOK is to change your habits around eating and preparing food. In the midst of our busy lives, the last thing most of us need is an overly complicated diet. Get the basics right, learn to cook a few meals you love, and eat plenty of them. Once you become accustomed to the whole foods, plant-based lifestyle, you'll quickly gain the confidence to create your own delicious variations.